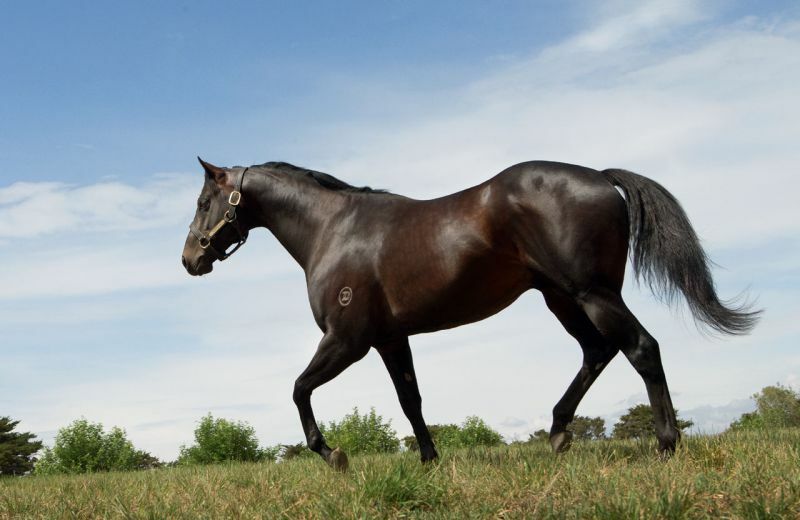 Like So You Think last season rocketed up the sires tables last year with his first crop of three-year-olds, Swettenham Stud’s Americain is starting to do the same this season. The Americain three-year-olds are starting to be tried over preferred distances with three Australian winners in the past three weeks of the new racing season. And in recent days, it was two Darren Weir trained colts owned by Americain’s Melbourne Cup winning owners that saluted the winning post. Amerock broke his maiden impressively at Donald on Saturday. He was bred and part owned by Colleen and Kevin Bamford at their Daisy Hill operation in Doreen. Amerock is from the beautifully bred Zabeel mare Miss Shamrock, a half-sister to Sun Stud’s stallion Fighting Sun through her Group 1 Oaks winning dam Irish Darling. Sold to Mark Hoare from Pacific Bloodstock for $30,000 at the 2016 Inglis Premier Yearling Sale, the Bamfords kept a share in Amerock. “We purchased half a dozen mares specifically for Americain, and I believe that Zabeel is going to be the most brilliant broodmare sire ever,” Colleen Bamford said. Amerock has pulled up very well from his run and may possibly start in the Morphettville Guineas which would gain some important black type for Miss Shamrock. On Tuesday, the Americain-Weir double was achieved when the Limerick Lane bred American Sunday won over 1300 metres at Mildura. Darren Weir’s stable representative Darryn Murphy was thrilled to see American Sunday win in the style he did and believes they have a very nice staying horse going forward. “Just terrific to see him win in these colours, the silks of Gerry Ryan, and John Sutcliff, Les Wharlow and Peter Maher, a great syndicate of owners and it is very pleasing for the stallion Americain,” Murphy said. 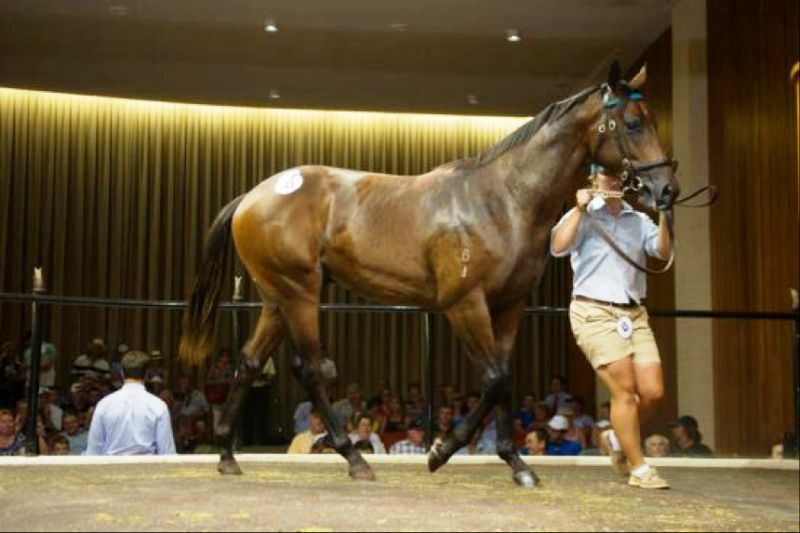 When Americain Sunday was bought by Darren Weir for $25,000 at the 2015 Inglis Premier Yearling Sale from the Swettenham Stud draft, (the now) part owner John Sutcliff was sitting with his old friend Gerry Ryan in the Swettenham marquee. “We decided at the time that we would buy him back and found Darren straight away to tell him we would take him. “Lucky we did, as he has actually paid for himself on his debut win. Thanks to the VOBIS Gold bonus (making it a winner’s cheque of $34,500) it has been a good day. “He is bred to stay being out of a Redoute’s mare Another Sunday. His grand dam, Bella Sunday is by Sunday Silence, and the third dam is by Rory’s Jester. Swettenham Stud principal Adam Sangster said the Americains were now physically coming of age and getting the results on the board. “It is great to see the two owners of Americain both breeding a winner so early in the season, and we are looking forward to a fruitful and successful spring,” Adam Sangster enthused. Progeny of Victorian First Crop sires ready and raring! The time between when a stud first stands a new stallion until that sire has his their first crop of racehorses on the track can be long and arduous. But for a number Victorian stallion farms, the long wait is almost over for their stallions that first entered the breeding barn back in 2014. These 2015 born crops of youngsters are now at the breakers, in the trainer’s stables and potentially just weeks away from making a trial or even race track debut. We spoke to a few stallion farm representatives about their first crop stallions and the two-year-old progeny that are progressing with their respective trainers. “We have received lots of good reports about the Fighting Suns, which is making him a very popular choice. “Being his fourth season, and often their toughest year, Fighting Sun will have his biggest book. This is a good sign that they are breaking in extremely well and that they are going to be running early. “There is a really nice filly out of Magic Art, with Tony McEvoy, syndicated by James Harron and JHB Syndications. “We have a War filly we retained, in training with Mike Moroney. Reports are that she has been good to educate, and Mike seems particularly happy with her. “There are also good reports coming from our local breaker, Bryan Maher. He has had three Wars go through his stables, and he likes the way they look and the way they feel, and has now booked in a mare to him. 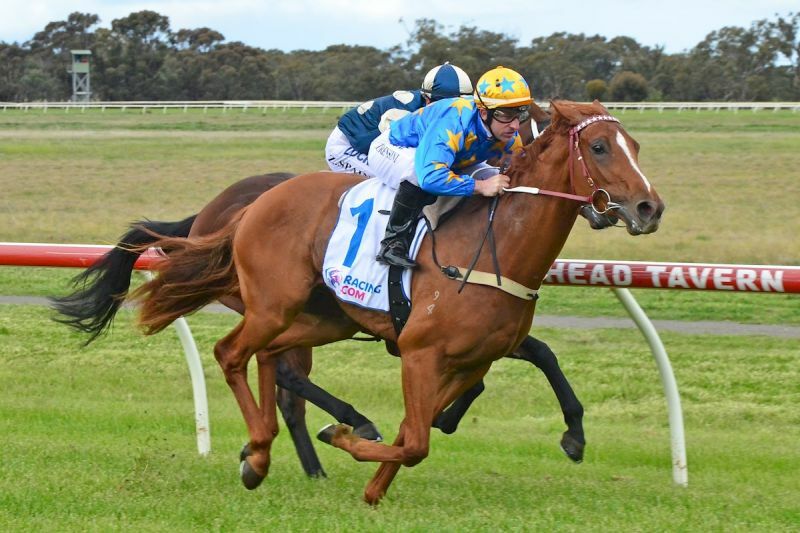 “Wayne Nicholls, who trains in Benalla, is also very enthusiastic about his two War babies, and has also booked into War this season, and we sold a very nice colt out of Crevasse, who is heading to the Inglis Ready 2 Race Sale in October. “After making fantastic money as yearlings at all the major sales, the Zoustars have ended up with many of the bigger, elite metropolitan trainers. “Zoustar’s trainer Chris Waller, has about 15 in his stable, which is a fantastic start for him…other trainers have called us just to say that they are very excited about their Zoustars and how precocious they are. “Zoustar has already had a two-year-old trial winner in New Zealand, so you know they are going to hit the ground running. “At our own pre-training and breaking facility, headed by Matty Upton, we have broken in six Zoustars, with most becoming part of the Woodside Racing Club. “Although it’s only early days, reports that we have been getting back are that they are very work-man-like. “They just love being in the stables and having a job just like Polanski did. They like being in the mix, around all the action and they have good temperaments and are working with us, to break in very well. “We have a real mix of types, with some that look like they have a bit of speed and will run early, and others looking rangier, suited to the classic staying races. “Two in particular, a colt from a Spinning World mare and a Success Express filly look very sharp which is exciting and will put their hand up as two-year-olds. “Now it is starting to get to the pointy end, we are very proud of Polanski, as we believe he has been very underrated. “Kuroshio was the epitome of juvenile speed. Wonderfully fast, by a champion stallion out of a great family. VOBIS Gold closes for 2015 foals TODAY! Racing Victoria (RV) is reminding all owners that nominations for Victoria’s lucrative owners and breeders’ inventive scheme, VOBIS Gold, close today – Thursday, 31 August 2017. Eligible horses will be able to compete for a share of over $8.5 million in VOBIS Gold prizemoney and bonuses annually, spread across more than 250 bonus races and 18 feature races as part of the exclusive VOBIS Gold Premier Race Series. For a one-off nominal fee of $1100, connections can nominate this year’s crop of two-year-olds (2015-born foals) for VOBIS Gold, as well as lodge late nominations for Super VOBIS before tomorrow’s 5pm deadline. Any eligible horse not yet nominated for Super VOBIS can still do so today (and then also nominate for VOBIS Gold) but late nominations apply. 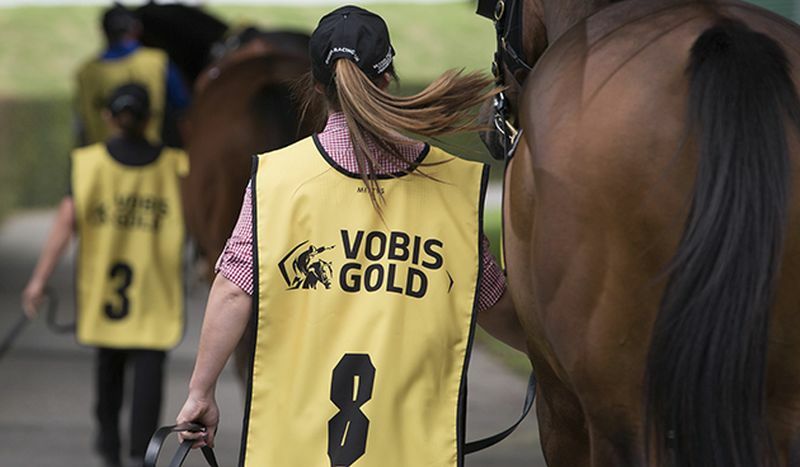 Since RV introduced the VOBIS Gold scheme back in the 2012-13 racing season, $45 million in VOBIS prizemoney and bonuses has been paid out across 893 VOBIS Gold bonus races, 58 VOBIS Gold Premier Races and 3,248 Super VOBIS bonus races. RV Executive General Manager – Racing, Greg Carpenter, said it has been encouraging to see the continued support of Victorian breeders, owners and trainers investing in VOBIS, which is enabling RV to expand the program each year. “In 2012-13, we conducted 78 races with a total of 734 runners competing in the VOBIS Gold bonus and Premier Races Series programs. Fast-forward to the 2016-17 racing season, and the number of races conducted (272) and starters competing (2,755) have more than tripled,” Carpenter said. As well as hosting the second edition of the $310,000 VOBIS Sires (1200m) for two-year-olds, the Victorian Owners’ and Breeders’ Raceday will also feature the running of the inaugural $310,000 three-year-old VOBIS Sires (1600m). Eligible horses must be both Super VOBIS ‘Category A’ and VOBIS Gold nominated to compete in the 2018 VOBIS Sires races, meaning they must be sired by Victorian-based stallions. The 2018 VOBIS Sires races are part of the 2017-18 VOBIS Gold Premier Race Series, which starts with the $150,000 VOBIS Gold Eureka Stockade (1400m) on Ballarat Cup Day – Saturday, 25 November. 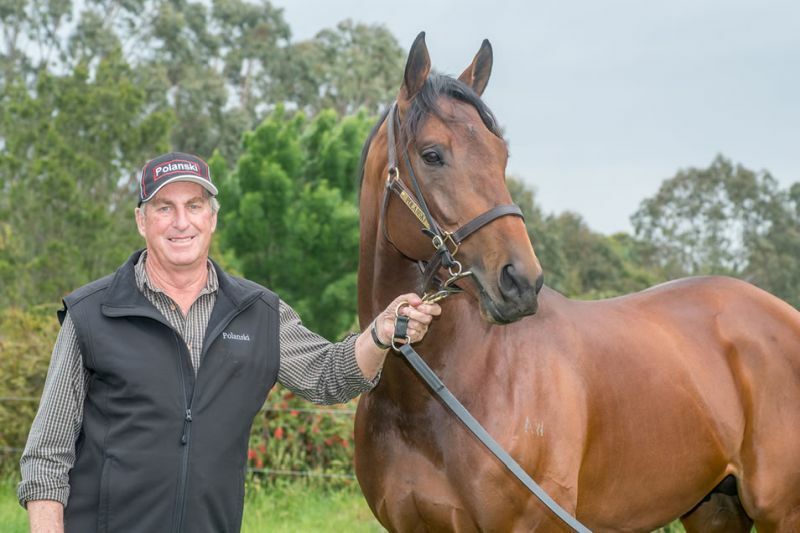 Stallion operations are always thinking of innovative new ways to drum up business for their charges and Anthony Mithen of Rosemont Stud in Victoria, Australia, has come up with a humdinger. Mithen is claiming to have managed to treble the book size for Starcraft for the coming breeding season with his ‘toss the boss’ promotion. Breeders are given the chance to call what they want – a colt or filly – and if they get the opposite, they do not have to pay the $8,800 covering fee. “We were struggling to get mares to him because people seemed to think he would be leaving Victoria,” Mithen told the Sydney Morning Herald. “We decided to give them the assurance that he would be here for the next couple of years at least and hopefully more. That’s why we bought out Arrowfield. “He has had only 30 or 40 mares for the past couple of seasons, but we already have 90 bookings for this year because of ‘toss the boss’. “I think everyone involved in racing is a punter at heart and this way they are getting a 50-50 chance of a free service. New Zealand-bred Starcraft found fame both south and north of the Equator by winning three Group 1s in Australasia for trainer Gary Newham before owner Paul Makin sent the horse to Europe. Starcraft was sent out by Luca Cumani to win the Prix du Moulin and to take the notable scalp of Dubawi when he landed the Queen Elizabeth II Stakes in 2005. The son of Soviet Star, now 17, has had some success as a stallion by supplying the top-class sprinter Star Witness and dual New Zealand Group 1 scorer We Can Say It Now. Peter Fusca’s Grandview Thoroughbreds will stand first season stallion San Padre, a son of Teofilo, this season at his Mickleham property. Situated only 10 minutes from the airport and only a stone’s throw from the Oaklands Inglis complex on 200 acres, his property’s undulating hills has been well set up for horses. Fusca has raced many successful horses with Mick Kent and was an owner of the new sire from the beginning of his racing days. After San Padre showed a touch of class to win his maiden, they were optimistic about his future. “He had bucket loads of stamina, he was strong and tough, he was certainly an exciting young stayer. A beautiful big colt who would improve as the races got longer, he needed a mile and a half.” Kent said. San Padre ran in four stakes races including a sixth placing in the Group 1 Victoria Derby and was competitive when contesting the Group 2 Autumn Classic at Caulfield and the Group 2 Moonee Valley Vase. Fusca, the managing owner throughout the handsome stallion’s race career, was disappointed that the racing public never saw the best of him. “He was hampered by a suspensory injury after his Derby run, so I made the call to retire him once we realised he would never show his full potential. “He was too nice a horse to keep racing when he wasn’t 100%, so I brought him home. “I have had six to eight horses in Mick’s stables at any one time. I don’t do it for the money, I do it because I enjoy the game and love my horses. I have been in the industry for over 30 years, and I’m very lucky that I am able to do it, to be truthful,” Fusca said. San Padre was an outstanding yearling topping the first day of the 2013 Inglis Premier Sale, selling for $250,000 to trainer Mick Kent. 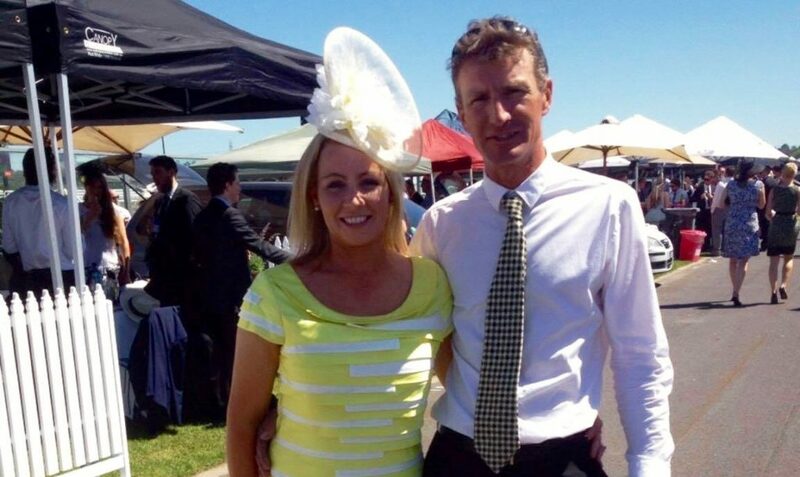 “Mick contacted me straight after the sales to become involved, as he just loved the horse. He had Derby written all over him, and that was why he paid the high price for him, with Gai being the under bidder,” Fusca said. “There was a lot of Fastnet Rock about him, he was by far my favourite colt at the sale. I paid more than I wanted to but I just loved him. 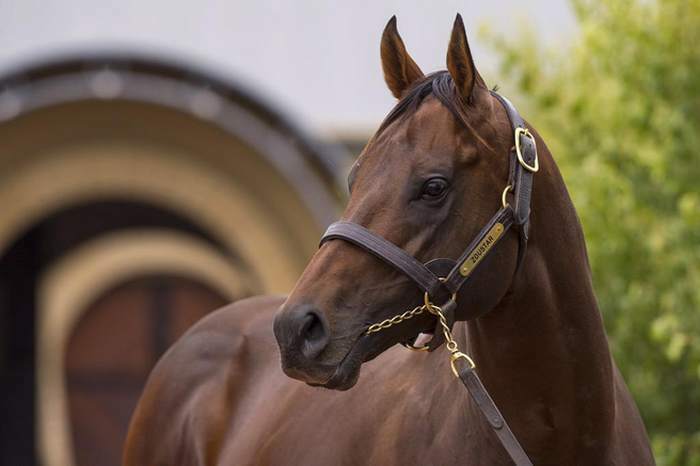 I can’t afford Fastnet Rock’s so I look at yearlings out of his daughters,” Kent said. Beautifully bred, San Padre has plenty of depth in his pedigree and is sired by the undefeated European champion Teofilo. He is the second foal out of the Fastnet Rock mare San Cristobel, who was a city winner herself at two. 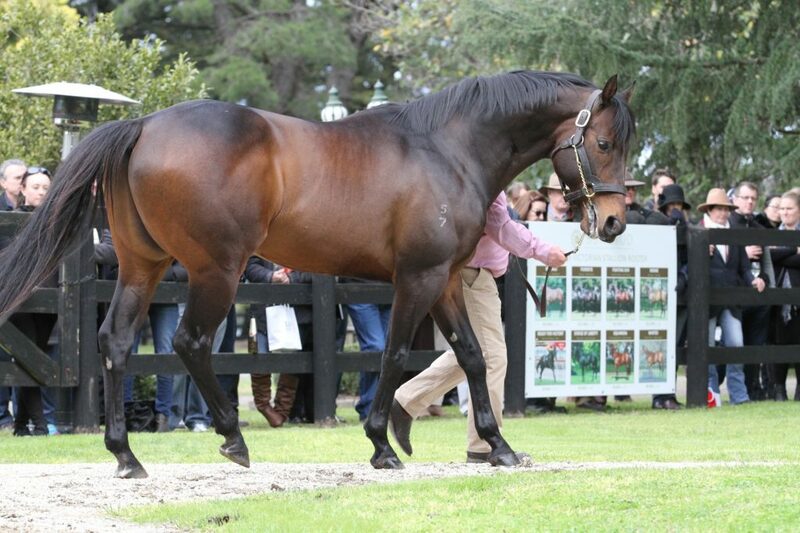 His grand dam Galapagos Girl, a dual Group 3 winner in the MRC Mannerism Stakes and the VRC Frances Tressady Stakes. She is a half-sister to brilliant producer Procrastinate, the dam of good stakes winners Laisserfaire, Foreplay, Personify and Time Thief. Fusca has a handy band of broodmares at Mickleham, with four due to foal any day. Being a supporter of the Victorian breeding industry, he is expecting foals from Victorian stallions such as Swettenham’s Puissance De Lune and Woodside’s Rich Enuff. 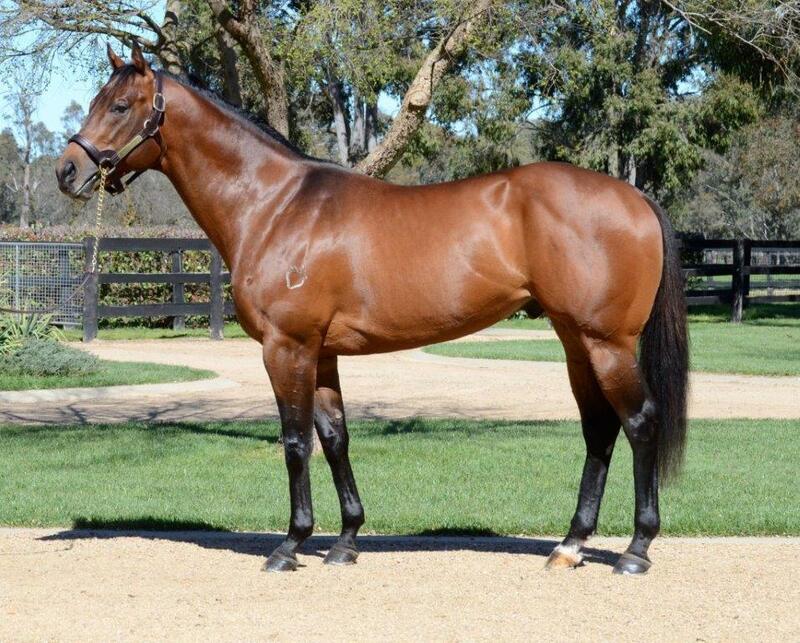 For more information on San Padre please contact Peter Fusca at Grandview Thoroughbreds on 0408 171 924. The arrival of his first foals in the 2017 season has created some excitement at Bombora Downs in Bittern on the Mornington Peninsula and rightly so. Bombora Downs stud principal Christoph Bruechert has breathed a sigh of relief with the safe arrival of the first of Dandino’s foals. “So far we have two foals by Dandino on the farm and if he is starting as he means to go on, then Dandino will exert great influence on his progeny. 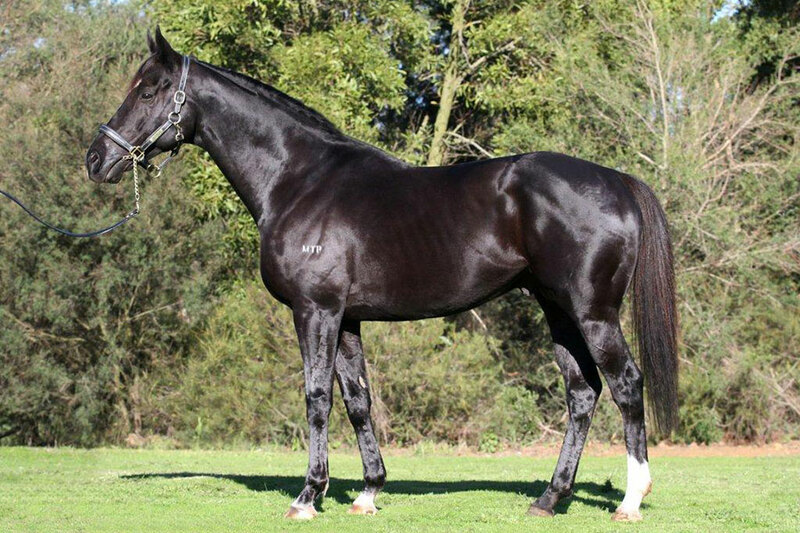 Dandino is an outstanding type, standing 16 hands with a wonderful temperament. He successfully campaigned in England, USA, Canada and Australia, winning Group races in all four countries. Although only winning to Group 2 level, he was placed twice in Group 1 races, including running second in the Caulfield Cup at his first start in his Spring Carnival campaign. He has an outstanding race record, having won 9 times from 37 starts, won or placed in 18 Group/Stakes races, and having won from 1800 metres through to 2700 metres. He started his racing career as a 2YO when he placed 2nd, raced until 8 years old and had a blistering turn of foot. Dandino is the son of Dansili who, from 14 crops of racing age (so far), has supplied 185 stakes performers with 71 Stakes winners. Dansili is now emerging as a force in the broodmare sire ranks, plus also as a sire of sires with many of his sons at stud in Great Britain, USA, Japan, Europe and New Zealand. 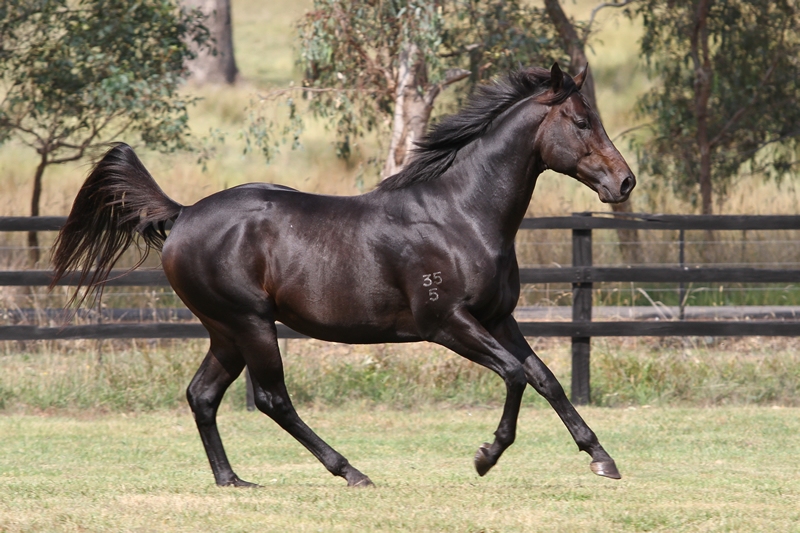 Stakes winners from this emerging sire line dynasty are coming on a regular basis and with the quality of his first foals, there is every chance that this will continue with Dandino in Australia. ‘Making’ your own stallions can be a tricky business, but Spendthrift Australia’s Garry Cuddy swears by it. 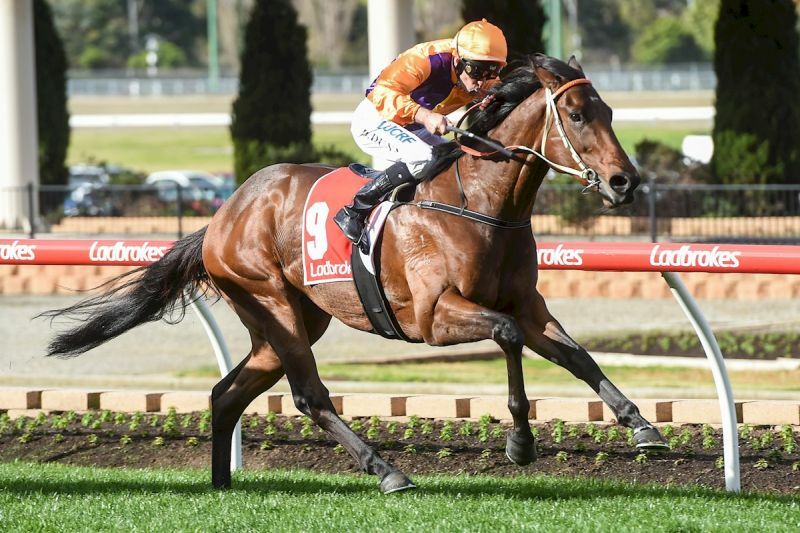 Macedon Ranges based, Spendthrift Australia has spent millions at major yearling sales in recent years, buying a collection of well bred colts: immediately followed by the crossing of fingers and toes that some of those buys will achieve black type success on the racetrack. It certainly worked in terms of Spendthrift’s excursion to Sydney for the 2015 Inglis Australian Easter Yearling Sale where the farm purchased a Redoute’s Choice colt from Champion Filly, Crossyourheart, for $725,000. The colt, named Swear, went on to win on debut as a 2YO, resumed at three with victory in the Group Three Ming Dynasty and ran Yankee Rose to a half length when second in the Group One Moet & Chandon Spring Champion Stakes over 2000m last spring. Swear has subsequently been retired to stud, standing his first season this spring at a fee of $8,250 on Spendthrift’s Share the Upside program and $5,500 on live foal terms. Not surprisingly, interest in the stallion has been substantial. So, it’s fair to say that Cuddy was in a buoyant frame of mind on Saturday night, just hours after the farm’s 3YO colt, Overshare, had produced his first black type victory in the Listed Essendon Nissan McKenzie Stakes over 1200m at Moonee Valley. It was some win too. Pinging out of the gates early, Overshare maintained his lead throughout and, despite the close attention of favourite and last start stakes winner, Bandipur, went on to record a gritty win. Purchased for $320,000 from the Victoria Park draft at last year’s Inglis Australian Easter Yearling Sale, Overshare is by I Am Invincible. He is from the Group 3 Doomben Roses runner-up, Savannah’s Choice and has now raced on five occasions for $122,700 in stakes. Winning over 1100m at Canterbury in June, Overshare resumed with a solid fourth behind Menari in the Listed Rosebud at Rosehill earlier this month. Following Saturday’s victory, co-trainer, Wayne Hawkes, wouldn’t be drawn on where the colt would head to next, but was obviously impressed by recent performances. “He (Overshare) is a great sort with a magnificent head and winning these kind of races is what it’s all about … he’s another promising colt that will eventually make his way to stud at Spendthrift ,” Hawkes enthused. Cuddy, meanwhile, reckons that purchasing Overshare was a no-brainer for Spendthrift. “First off, in terms of conformation, he’s A plus,” Cuddy points out. Savannah’s Choice is a half sister to six other winners including Champion 3YO Filly, Cesario, in turn the dam of Japan Cup winner, Epiphaneia and another Group One winner in Leontes. The family also includes European Champions Anna Pavlova, Gothenberg and Fascinating Rock. “Overshare is the first stakes winner from the colts Spendthrift purchased in 2016, but only three have raced at this stage for two winners, including Hualalai (a Street Cry colt who won at Rosehill last month) who is running in the Group 3 McNeill Stakes on Saturday,” Cuddy adds. Swear is one of four filling the Spendthrift stallion ranks this season and will stand alongside Jimmy Creed, who recently posted his first stakes winner via 2YO filly Spectator (Grade 2 Sorrento Stakes) and is ranked third in the North American First Season Sires’ premiership … Group One winner Hampton Court … and proven Medaglia d’Oro stallion, Warrior’s Reward. 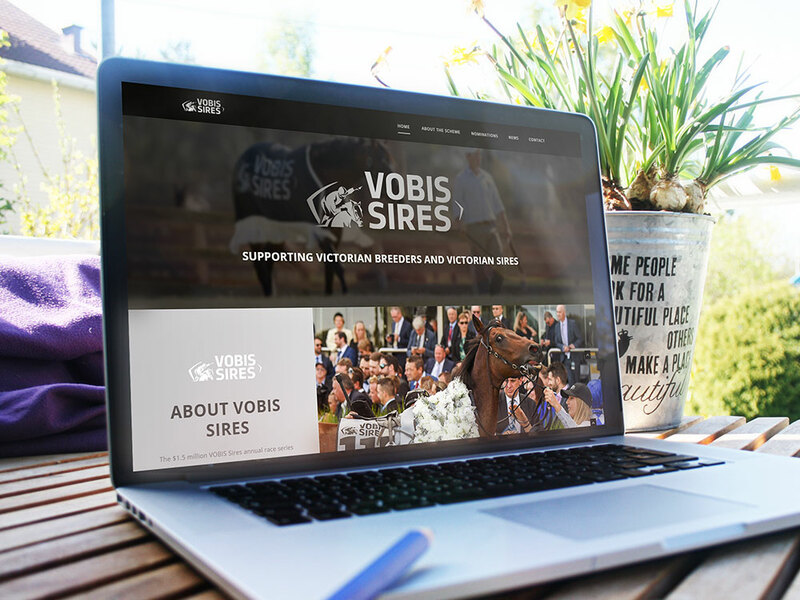 Breeders and buyers alike can now access up to date information on Victoria’s exciting VOBIS Sires race series with a launch of a dedicated website. 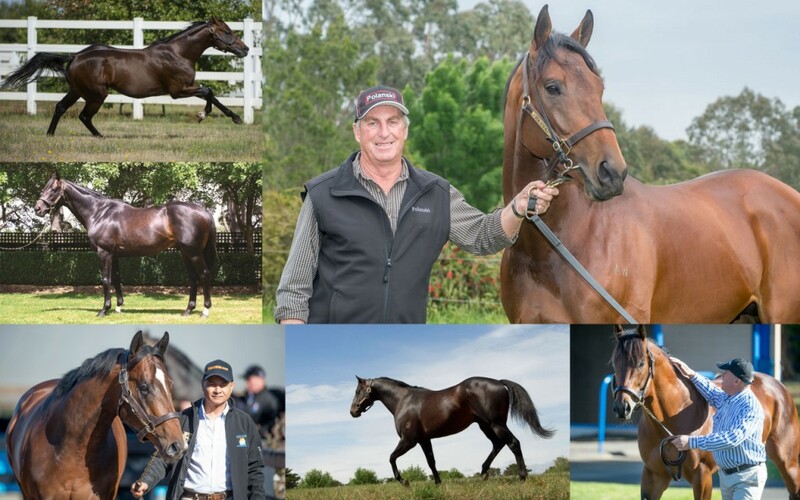 Thoroughbred Breeders Victoria (TBV) has developed the sleek looking website which provides full information about the newest addition to VOBIS, Victoria’s world-leading owners and breeders incentive scheme. 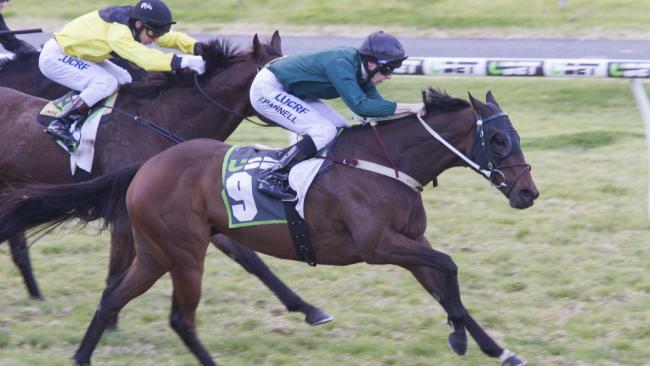 a $500,000 three-year-old race over 1600 metres to be run for the first time in early 2020. “Super VOBIS and VOBIS Gold already have on offer close to $20 million every year in bonuses and prizemoney across Victorian races. VOBIS Sires adds a guaranteed $1.5 million to those returns,” Patrick Clancy, TBV’s Executive Officer said. The 2016 foal crop – set to be sold at the upcoming yearling sales in early 2018 – will be the first eligible for the $1.5 million VOBIS Sires feature races should their Victorian-based sire be entered into the scheme. This season, there are already 52 Victorian stallions nominated to the scheme giving broodmare owners from across Victoria and beyond plenty of options to breeder a foal eligible for VOBIS Sires. The 2018 yearling sales will see the first crop of VOBIS Sire eligible yearlings pass through the auction ring (yearlings born in 2016 from the mares covered in 2015). Buyers including trainers and syndicators, are encouraged to look up the VOBIS Sires nomination list of 2015 to see which yearlings they can buy and aim at the $1.5 million race series starting in season 2018/2019. There will be no fee for owners to enter their horse into VOBIS Sires. All they have to do is make sure it is signed up to VOBIS Gold prior to 31st August 2018. TBV will be updating the site regularly during the upcoming breeding season and then leading into the 2018 yearling sales around Australia and New Zealand. “Going into the yearling sales, VOBIS Sires will become a prominent brand giving buyers clear indication which Victorian sired yearlings are eligible for the rich races,” Patrick Clancy said. TBV was already writing a story on the success of Basinghall Farm’s 2016 yearling sale graduates on the track, but it was a veteran who showed up all of the young’uns over the weekend. Seven-year-old Mio Dio (God’s Own), bred by Tas and Julie Rielley at their Basinghall Farm in Nagambie saluted in the $120,000 Group 3 Spring Stakes at Morphettville. His name, means “my God” in Italian and that was certainly the reaction from punters when he rolled odds-on favourite Lankan Rupee in the race. His maiden stakes win was great news for the Rielleys who have had tremendous success of their 2016 yearling sales graduates this year. Already there are several stakes and city winners among them. Mio Dio has gone up a gear or three upon entering the stables of trainer Will Clarken. Under his care, he has won five races from 11 starts and collected more than $230,000 in prize money. Mio Dio cost just $5,000 as a weanling at the 2011 Inglis August Thoroughbred Sale at Oaklands Junction. Incredibly, there was little, if anything wrong with the then colt, according to vendor, Tas Rielley of Basinghall Farm. “He (Mio Dio) was actually a very nice weanling. Had a lot of quality about him. Mio Dio’s sire, God’s Own was still fairly popular at the time (God’s Own yearlings sold up to $160,000 in 2011), while his mum, Hageabi, was well related,” Rielley said. 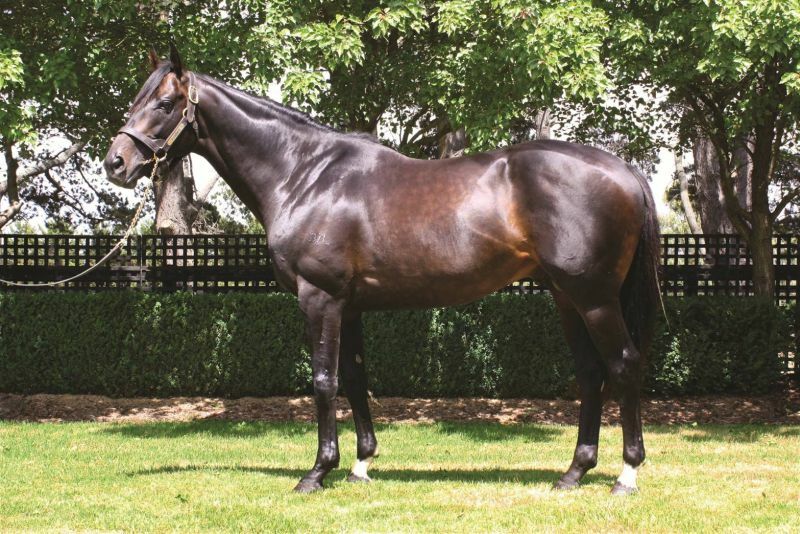 “(His dam is) a three quarter sister to a Group One winner in Piavonic, in turn the dam of (Group Two) VRC Sires’ Produce winner, Von Costa de Hero, while other close relations include stakes winners Emlozza and Doppio. I’ll Have A Bit (Smart Missile x Take All of Me filly trained by John McArdle) – Won the Group 3 National Stakes at Morphettville as a 2YO. 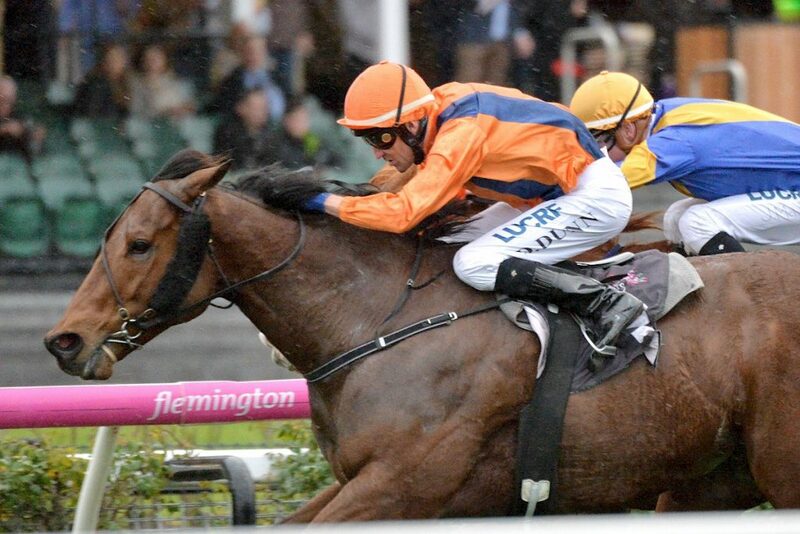 Ran in the Group 3 Quezette Stakes on Saturday and is entered for the MRC Thousand Guineas. Bris Vegas (Ilovethiscity x Sprit of Sienna colt, Ryan Balfour) – A winner at Morphettville last season as 2YO and was a runner up at the same venue on Saturday. Snitz (Snitzel x Tickle My colt , Matthew Dunn) – A winner at Grafton as a 2YO and placed multiple times at Doomben. Van Winkel (Magnus x Wickedly colt, James Rundle) – was a runner up at Rockhampton in his only career start so far earlier this month. Onset (Reset x Olnisotto filly, Wendy Kelly) – yet to race, but is entered for the MRC Thousand Guineas. “The Inglis VOBIS Gold Sale has been a fantastic sale for Basinghall Farm, as we have achieved some great prices for our yearlings,” Rielley said. “At Basinghall, our philosophy is simple…let horses be as horses are …nurture them in their natural environment where they can thrive under expert care and supervision. Western District based Michael Niall passed away recently bringing to an end a remarkable chapter in thoroughbred breeding. Michael and his brother Donard (who passed away in 2015) were renowned beef and sheep producers at their Coleraine property Parkwood, while also maintaining a love for breeding and racing horses. Swettenham Stud has prepared their remaining breeding stock for sale at the Inglis August Thoroughbred Sale this Friday, 25th of August. The Nialls bred their first winner, Miasma, in 1950 after sending a mare up the road to stallion Meadow Mist, which stood at former Victoria Racing Club Chairman, Sir Chester Manifold’s property at Camperdown. But it was some North American breeding transactions by the Nialls earlier this century which are of great interest. The Niall brothers purchased several broodmares during a trip to Kentucky in the mid-1990s. In 2009, they sent two of these broodmares to the then unheralded Tapit. Dontwaltzme, was a daughter of Afleet Alex that they had bred in the USA while the other was a Jade Hunter mare named Jade Dreamer. They secured the service at a cost of just US$20,000! That compares with Tapit’s current fee of US$300,000 which has risen off the back of producing 21 Group 1 winners, six champions and five Breeder’s Cup winners among many other successes. Once safely in foal, the two mares were sent to Australia where Dontwaltzme produced a grey colt and Jade Dreamer foaled down a grey filly. This filly was retained by the Nialls and named La Ballerine. She was covered by Trust In A Gust in 2016 and will be offered through the Swettenham Stud draft at this week’s Inglis August sale. Among other results in North America, the Nialls bred the top lot at the 2014 Fasig-Tipton Florida select sale of 2-year-olds in training. The Malibu Moon colt out of the unraced Pine Bluff mare Lizzy’s Bluff had been sold as a yearling for US$200,000then sold as a two-year-old for a sale high of US$1.2 million to Coolmore’s Demi O’Byrne. The passion and stories behind the Nialls’ beautifully bred bloodstock will continue on and no doubt Donard and Michael will be up there, following each foal, weanling and yearling with as much enthusiasm as they did when they were breeding and racing them themselves. Swettenham Stud is presenting on behalf of the Niall family, the Greendale Trust draft at this Friday’s Inglis August Thoroughbred Sale. Swettenham’s General Manager, Brian Gorman, believes the international pedigrees on offer will certainly gain the attention of the astute buying bench. 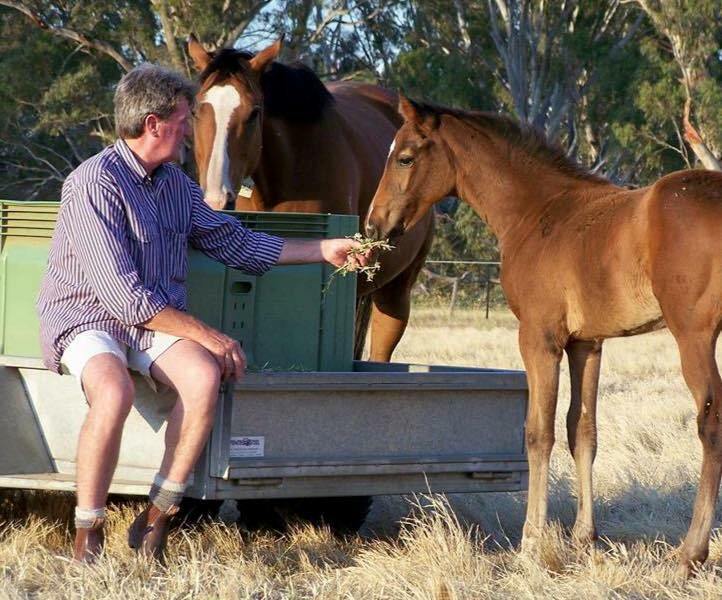 “When Swettenham was consigned the Greendale Estate horses, we decided to complement their draft with a group of lovely young mares we had bred in partnership. Together, we present an attractive selection of quality mares that have been well mated with highly sort-after pedigrees,” Gorman said. In a rare opportunity for breeders, all 23 lots in the Greendale Trust draft will be offered for sale unreserved. “She is a well put together mare who throws a great type with an impressive international family. Her dam Lizzie’s Bluff produced the $1.2 million colt sold to Coolmore at the 2014 Fasig-Tipton Florida select sale of 2-year-olds in training,” Gorman said. View the full catalogue for Friday’s Inglis August Thoroughbred Sale. 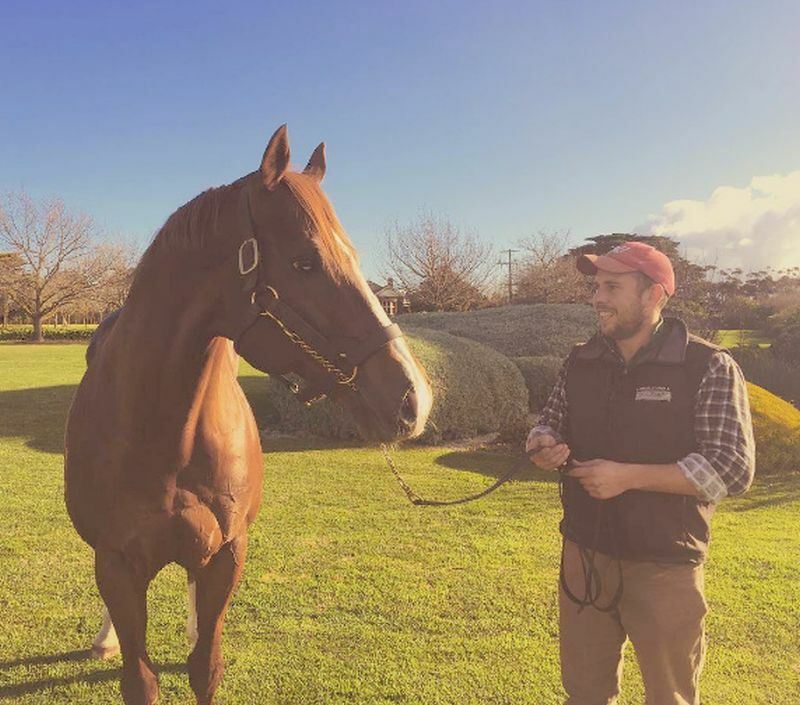 Primus, sire of the mighty Burning Front, has a new home this year. He will be standing for the 2017 breeding season at Rene Pompe’s property, Sutherlands Downs, just outside Geelong. Pompe, who owns the local Landmark agency, has been looking for a stallion prospect for about six months through studs and agents. Together with his partner, the passionate horsewoman Tammy Miller, they are thrilled with the acquisition of Primus (Flying Spur). “We were looking for a kick off stallion. We have both been in the industry for over ten years, in a combined involvement of ownership, agistment, breeding mares and racing and we wanted to get into another thoroughbred venture… to stand a stallion,” Pompe said. “We looked at a few, but nothing stood out, as we wanted a traditional Australian bred stallion with colonial bloodlines, a tried and true pedigree. So when Primus came on the radar we were very excited and believe he is the perfect fit for our boutique farm,” Pompe said. Primus was purchased from Justin Lovatt, a renowned stallion handler and breeder of Burning Front. Lovatt is keen to stay involved in the stallion’s career and will continue to send mares to him. “Susan Keating from Liverpool Farm, near Strathbogie has also been great, and was a wealth of information on the stallion and showed us around the farm. She will always have an involvement and will support him with a mare or two every year. Pompe owns a band of eight nicely bred mares and, along with Primus’s loyal supporters, he is hoping to cover a manageable number of 25 mares. Nominated for the VOBIS Sires scheme, Pompe is well aware that Primus features very highly with VOBIS, especially through the exceptional $1 million-earner Burning Front who has won more VOBIS bonuses and prizemoney than any other racehorse. Primus was a Group 3 winner, consistently placed Group 1 and Group 2 races including the Caulfield Guineas and Randwick Guineas. Clearly suited as a sprint-miler, Primus then recorded consecutive stakes wins in the Listed Show County and the Group 3 Tramway Quality. He retired with four wins and six placings from 17 career starts, amassing $524,780 in prize money. 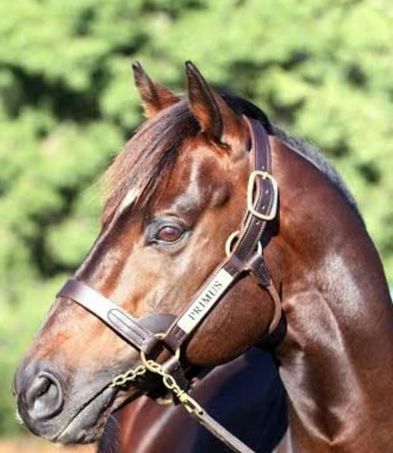 He hails from the all-conquering Denise’s Joy maternal family which includes champion mare More Joyous, Group 1 winners Miss Danehill, Arlington Road, Fenway, Bentley Biscuit, Sunday Joy and Tuesday Joy and Champion NZ sire, Thorn Park. Primus’s progeny includes his most celebrated son, Burning Front who will aim to pick up a maiden Group 1 win this Spring under the care of Darren Weir. Primus has also sired the Victorian bred Singapore listed winner Laughing Gravy, the talented Apollo Creed, Sandown winner Rooboy, three-time winner Jarrvis and metropolitan winners Firestorm and Primitive Man. Current galloper and Flemington winner, Niminypiminy has his ‘hoof on the till’ with a great last up run at Caulfield, and is ready for a promising spring ahead. Primus will be standing for $4,400 (GST incl) at Sutherlands Downs. That fee includes agistment for the mare until a 45-day positive test is recorded. Sutherlands Downs consists of 107 acres of improved pasture ideal for horses, with Horse Rail fencing and individual foaling paddocks close to the house. Mares are individually cared for, rugged when required, alarmed and well fed. Please call Rene Pompe and Tammy Miller on 0419 764 940 or info@sutherlanddowns.com.au for more information. The promising Miss Jane won recently at Morphettville helping to give her sire Skilled a kick-along at his new Riverbank Farm stallion barn surroundings. “We always thought she could do something like that,” said co-trainer Niki O’Shea of the four-year-old who has now won three of her four starts. Boasting crosses of Danehill’s third dam Natalma and Rainbow Quest’s grandam Where You Lead, Miss Jane is a daughter of emerging stallion Skilled who is proving popular at his new home; Riverbank Farm, Benalla. Riverdene’s Russell Osborne and Dr Caroline Duddy have been pleased with the response to Skilled with a number of breeders ringing to let them know how well their youngsters by the well credentialled son of Commands are shaping. Cranbourne trainer Allison Sheehan is one with wraps on her Skilled filly, a half-sister to multiple city winner Andrassy. “She is the biggest and scopiest foal out of the mare, she has had two preparations and I am very happy with her, she has a super temperament,” Sheehan said. A three times winner at two, Skilled put his precocious class on display with victories in the Listed Baillieu Stakes and the Group One Champagne Stakes. Continuing to perform consistently in the best of company at three, he finished second to Ilovethiscity in the Group 1 Randwick Guineas, also recording game placings four other stakes races. Joining Miss Jane as Skilled progeny with talent are the likes of Lady Skills (a gallant second at Sandown last week), So Skilled (winner of two in a row in Adelaide earlier in the year, recent Macau winner Altered (Eagle Farm placed before heading to Asia) and last start easy maiden winners Conwoman and Regina del Nilo. Skilled stands at a fee of $3300 (incl GST) and, as a wonderful bonus, all reproductive vet costs are included in that with Dr Caroline Duddy one of the region’s most renowned equine vets. He’s probably the most sought after young horse in the southern hemisphere. Royal Symphony, unbeaten in three race appearances, is bringing in offers of more than $3 million from bloodstock agents around the globe. Outside of Winx, Royal Symphony is set to be the next drawcard of the spring carnival when he commences his pathway to the rich $2 million Caulfield Guineas in early October at Flemington. Which makes his breeder, Joe Vella, wince every time the purchase fee of just $40,000 is mentioned, saying: “Do you have to put salt on the wounds? It’s just like having a winning tatts ticket and tearing it up”. But Vella is hoping for a second chance of sorts – not with Royal Symphony, but a potential, unborn brother or sister via Naturalist, Royal Symphony’s 25-year-old mother. Vella, who owns Wingrove Park at Macedon, always had a soft spot for Naturalist, who produced Royal Symphony as her 16th foal at the age of 22. “She’s been a remarkable broodmare, just so fertile. Every mating was very quick and she was an exceptional mother. “She gave everything to her foals. Her milk was brilliantly pure, even to the point of her own malnutrition. She would give so much to her offspring that she’d start to lose condition herself,” Vella said. He has called in some of the best veterinary experts from around the globe to see if she’s capable of conceiving again. “With such remarkable fertility on her side and a clean bill of health, as well as having three rugs on her every night we’ll just see how we go. If we get the all clear we’ll mate her with Doomsday and hopefully a brother or sister to Royal Symphony will be produced,” he said. Vella proudly upholds the success of his boutique stud farm, which has a 93 per cent win rate – a strike rate more than comparable with some of the most powerful farms in Australasia. “It’s funny, when Royal Symphony was a foal running alongside his mother, he was always biting and pushing other colts out of the way. He had a real personality. Ok I sold him for $40,000, it does hurt. “But then again I sold a horse called Fair Trade to Hong Kong for $1.2 million and hours after the cheque had cleared the horse was involved in a serious accident at the swimming pool at Sha Tin which meant we never saw the best of him. “That’s the sort of luck it is. That’s what keeps us pushing on, the hope of that next best horse. We’ve been lucky here, we’ve had success and success drives us on,” he said. If Naturalist returns to the breeding barn this spring and successfully produces a foal by Doomsday, it’s safe to say it won’t leave Wingrove for $40,000. In fact, as Royal Symphony’s career blossoms, one suspects Joe Vella may keep it all for himself. Quickly progressing through the grades, Raheeb was slowly away in the Group 2 Phar Lap Stakes at just his fifth start, only just missing out in trying conditions. After several stakes placings, it was his turn for stakes glory in the Group 3 Cameron Stakes at Newcastle. Retiring to stud as the winner of four races and more than $350,000 in stakes, Raheeb kicked off his breeding career at the now defunct Patinack Farm before moving to Wattle Brae Stud. As is so often the case with stallions who have been moved around, his stud career has been disrupted with his mare numbers dropping off. He has however proven a source of winners with 38 winners and 20 place-getters from just 92 runners. All That Is, Raheeba, Clair and Bambino Clementine are all metropolitan winners whilst Man Around Town and Ribands have been prolific performers on the provincial circuit. 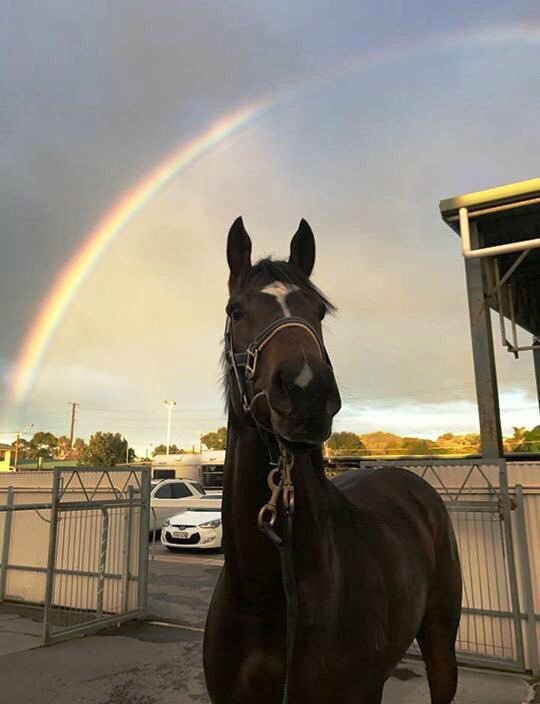 As has La La Loopsy who looked good winning four of her seven starts to date – also a game second in the $150,000 Western Qualifier of the Country Championships at Dubbo. For further information on Raheeb, who will stand at $2200 (incl gst), contact Andrea Otto on 0427804581. Larneuk Stud’s Neville Murdoch has always been proud of his underrated consistent stallion O’Lonhro – all the more so when the quiet achiever was recognised at last week’s Northern Region Thoroughbreds Awards. Earning the title of ‘Best Stallion Under $10,000’, O’Lonhro was recognised for the great job he has been doing for those in the owner/breeder market. 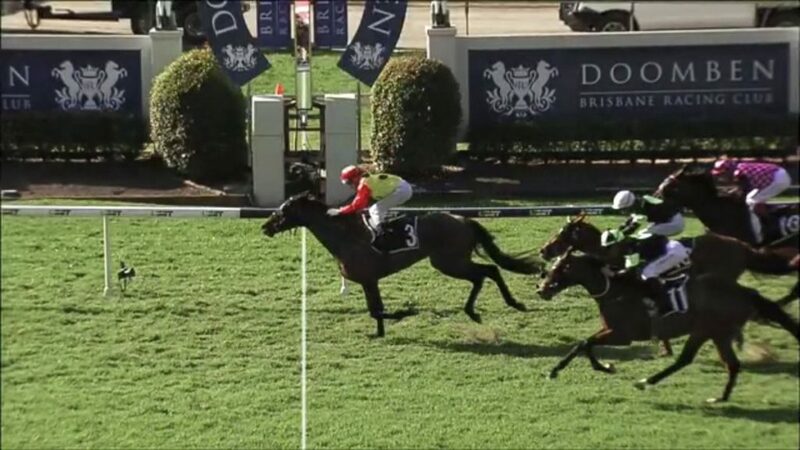 72% of O’Lonhro’s runners for this season have won or been placed and, on Wednesday at Doomben’s big Ekka meeting, he was represented by another new city winner with the Chris Munce trained Skyscraper impressively claiming his maiden. “He is a solid galloper. It was only his third start and he will keep improving. I thought the blinkers on today would help him focus and he showed that he has got a great will to win,” Munce said. “So many of the O’Lonhro breed show good natural pace – they are tough, sound competitors who put themselves in the firing line and try hard,” Murdoch said. 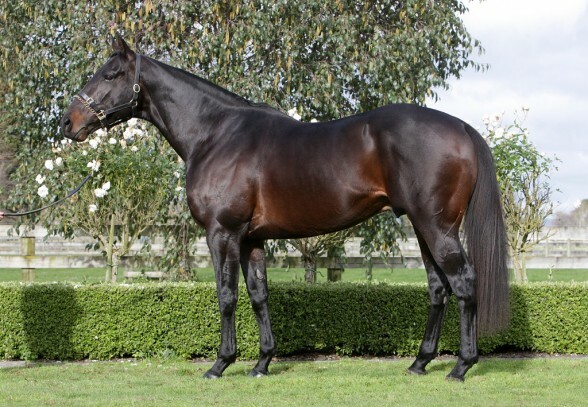 An imposing near black stallion built very much in the mould of his eleven times Group 1 winning sire (sire of 68 stakes winners), O’Lonhro won the Group 2 Chelmsford Stakes (a race also won by Lonhro on two occasions) in record time. Yarram’s Adrian Hall remembers Melbourne Cup day 2014 very well. Not that he backed the winner. Far from it. In fact, it was the day they had to put down his solitary broodmare, Heyington Honey, after a month long battle with navicular disease. Adding to the pain, Heyington Honey’s Your Song foal followed less than 24 hours after. Hall admits he was gutted by the whole sorry saga and thought seriously about giving the breeding caper a wide berth. By that time the mare had produced a Congrats filly and a Duporth colt, but neither had raced and Hall mused the Your Song “probably would have been a superstar”. That’s something we’ll never know, but Heyington Honey’s Duporth colt – now racing as Hey Doc – has done plenty to right the ship, capturing Saturday’s Group Three Aurie’s Star Handicap over 1200m at Flemington and priming himself for a big spring campaign. Trained by Tony McEvoy, Hey Doc has won seven of 15 outings and over $1.1 million in stakes, including the Group One Australian Guineas (1600m) in March and is next likely to tackle the $1 million Group One Memsie Stakes (1400m) on 2 September. 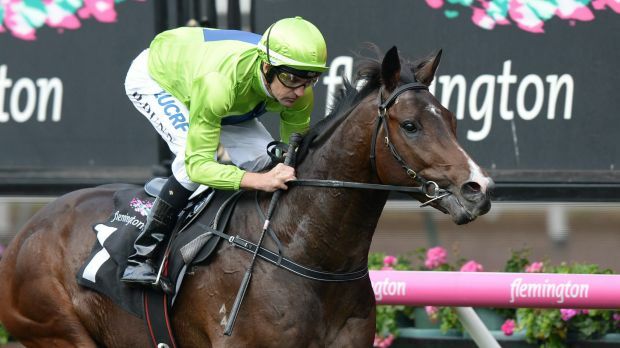 Success in the Memsie could then be followed by a tilt at another rich spring plum in the Group One Makybe Diva over the same journey as the Australian Guineas. Understandably, McEvoy was mightily impressed with Hey Doc’s performance in the Aurie’s Star given that the 4YO was not only resuming, but was also asked to lug 59 kilos down the Flemington straight, giving up to five kgs to rivals. “He (Hey Doc) lifted with his big weight and showed that he’s a class horse,” McEvoy enthused. “We’ve got three weeks now to fine tune him into the Memsie. When you look at the history of this race (Aurie’s Star), good horses return in it and run well. He’s fitted that mould beautifully. So too, obviously, is Hall. The Victorian-based cabinet maker wisely decided to retain a share in Hey Doc when the youngster was consigned to the 2015 Inglis Melbourne Premier Yearling Sale where he was sold to McEvoy for $85,000 from the Rosemont Stud draft. Hall also raced Hey Doc’s half sister, Heather Honey, which he leased out to family and friends, but she has since been retired and will be covered this spring by Street Boss. “My father Brian and I purchased a 50% share in Heyington Honey for $3,500 at the 2010 Inglis August Thoroughbred Sale and while she had shown talent early on, she had knee problems and the decision was made to retire her to stud. Turns out to be the best $3,500 I’ve ever spent. “Heyington Honey was bred by Bill Cockram’s Shadow Glen and he kept a share in her as a breeding proposition … and while it was heartbreaking to see what happened to the mare and her foal, Hey Doc’s continued success is going a long way to making up for it. “I’ve now got four mares which include Hey Doc’s half sister and another close relation that I purchased who will be covered by Lonhro this year. A Sunday drive from Greta West in North East Victoria over the Alpine National Park down to Sale is a 390 kilometre or five-hour plus journey. That’s the (unlikely in winter) Sunday journey a Flemington winning breeder could have taken to visit her horse at his Sale stables after he won on Saturday. 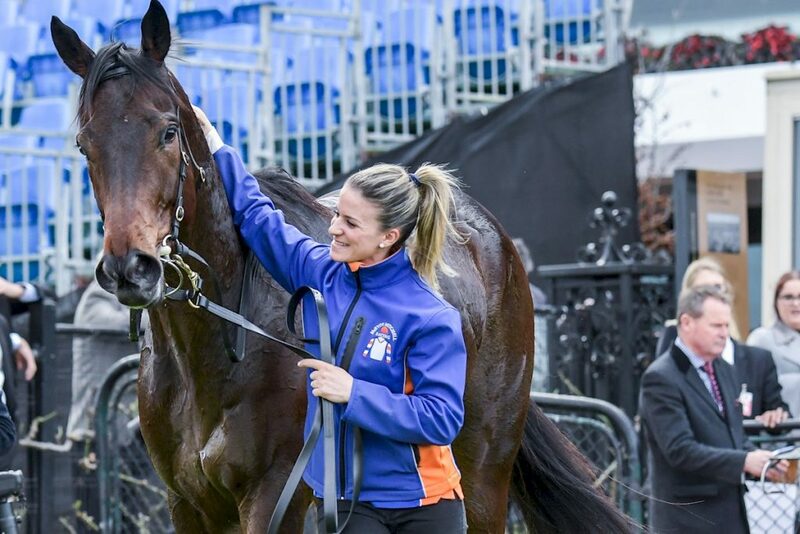 Bucklee Farm’s Leeanne Smith was certainly cheering home her homebred Sunday Escape (Hard Spun) when the seven-year-old gelding held on for a tough win over 1000 metres at Flemington. 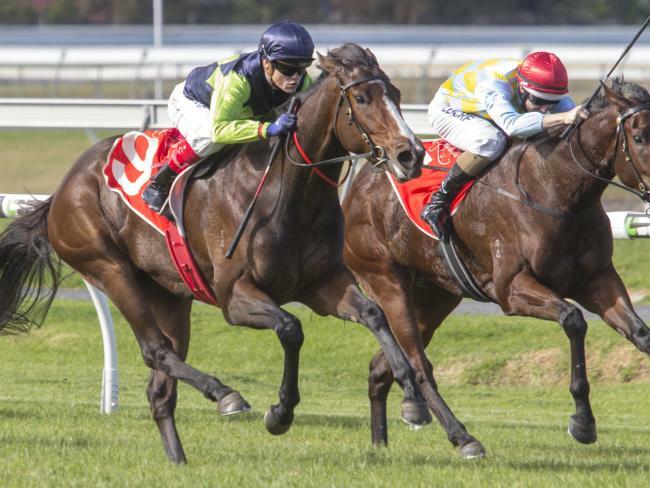 Trained and co-owned by Sale’s Andrew Murray, Sunday Escape led all the way and held off a fast finishing So Si Bon and in-form Play Master making it a Victorian bred trifecta. “At this level, he needs the speed to be perfect. He hasn’t got a big kick, but he can stay strong, so it needs to be perfect early so they can’t get us or get away from us. He’s tries hard, and that’s what keeps him in these city races all the time,” Murray said. With earnings of over $320,000 and five wins and nineteen placings in 35 starts, he has been an ultra-consistent galloper. 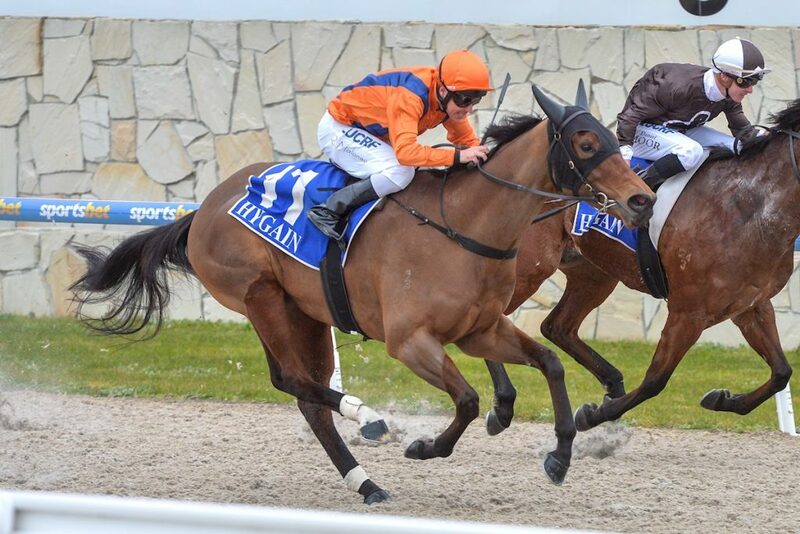 The win came in the same week Sunday’s Escape’s little half-sister Weekend Escape (Helmet) won on debut at Pakenham. She is trained by Robbie Griffiths. “Murray has certainly got a fondness for Sunday Escape’s dam, the mare Induct, as he has now trained three of her offspring,” Leeanne Smith said. “They have done a marvelous job with Sunday Escape and I am so happy he has been such a great horse for them. Leeanne has a very special fondness for her mares and there is no doubt Induct has a very special place in Leanne’s heart. “It’s very special when mares produce for you. I bought her for $1,200 at the Inglis broodmare sales in foal to Dubai Destination. I was looking for a bargain, and I certainly found one. “She is worth much more to me than what she would be worth to sell even with her current pedigree. Induct has a quality Canford Cliffs yearling, but unfortunately missed this season to Helmet. Sunday Escape was sold for $80,000 to trainer Andrew Murray at the 2012 Inglis Premier Yearling Sale. A half brother to trained Darren Weir trained Group 3 Aurie’s Star winning gelding Broken, he was a lovely type as a yearling and very popular with buyers. “He was right at the end of the sale, and I reckon most of those bigger buyers were full. I had a buyer from Hong Kong tell me he was a really nice horse, but he only had $50,000 left, so I was pretty lucky to get him at $80,000,” Murray said. Bucklee Farm is looking forward to spring, with good rainfall late helping to kick off the lush spring grass when the warm weather approaches. The farm certainly is going through a purple patch at the moment with not only Sunday Escape and Weekend Escape tasting victory, but also Hay Bale (Canford Cliffs) who was raised at the farm and recently won at Flemington. “It is so special to see them out there racing as a breeder. The farm is certainly having a little bit of fun at the moment,” Smith said. A tilt at the Derby is Sheer Madness? What does John Salanitri look for in a yearling? The Victorian trainer admits it’s a question he’s regularly asked and, while there’s any number of boxes to be ticked when he’s at a sale, Salanitri reckons that it often boils down to the intangible … “you just know it when you see it”. Salanitri ‘saw it’ in the Moshe yearling from the Huntworth Stud draft at last year’s Inglis Melbourne Premier Yearling Sale, eventually paying $40,000 for the privilege. True that. 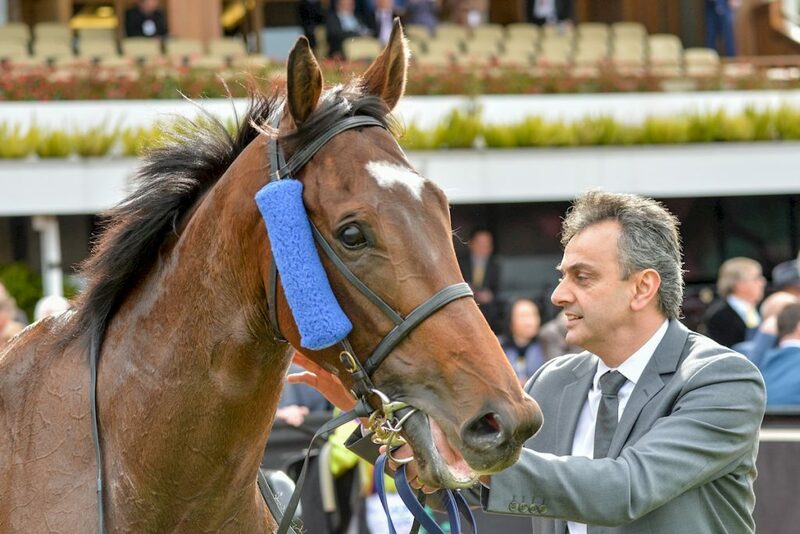 On Saturday, Salanitri’s monster Moshe – a 3YO by the name of Sheer Madness – proved he is a genuine contender for spring honours by capturing the VRC Raymond Ali Handicap over 1400m at Flemington in emphatic fashion. Sheer Madness raced on seven occasions as a 2YO, finishing two lengths off the pace on debut in the Listed Blue Diamond Preview and was also tried in the Group One Blue Diamond (won by Salanitri in 2000 with Road To Success) where he finished 12th behind Catchy. “I’ve always thought this horse had plenty of potential from the minute I got him home,” Salanitri adds. “He’s a bit behind mentally and tends to put himself in awkward positions during races so it’s pretty frustrating actually. “Over the years I’ve ridden a lot of good horses and while he (Sheer Madness) is showing me a lot on the training track, he hasn’t been putting it together come race day. Sheer Madness, who is out of the winning Flying Spur mare, Olympiad, was bred by the boutique yet perennially successful Huntworth Stud in NSW’s Southern Highlands. Peter Stewart, who runs Huntworth with partner, Bridget Woodford-Smith, remembers Sheer Madness well. “Gee, he was a big foal,” Stewart explains. “The mare (Olympiad) only lived for another three or four days and after that the foal was raised off a nanny. 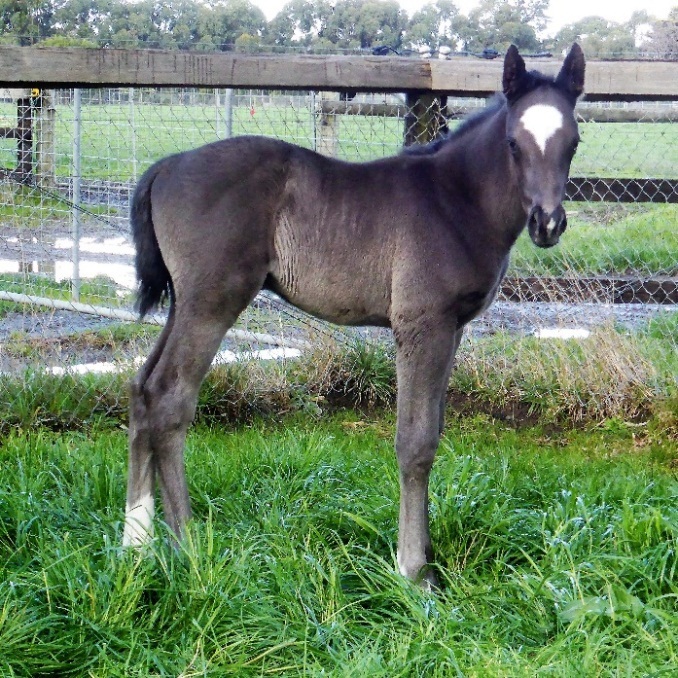 “Olympiad’s first foal (by Hussonet) died and then she produced a Haradasun filly called Cambage (trained at Hawkesbury by Scott Singleton and most recently raced in the ATC Oaks in April). “Despite his size, Sheer Madness was a very nice yearling and it’s a good family too: Olympiad is a half sister to the Singapore stakes winner, Spanish Bay, but is also closely related to Khaptivaan and Khaptingly. The prospect of third season sire, Moshe, producing a Derby winner would definitely be a departure from ‘form’ given that his winners thus far have never won further than 1650m, while the stallion himself was an out and out speedster. Standing at Sun Stud Victoria, Moshe is a full brother to the legendary Black Caviar and multiple Group 1 winner All Too Hard. It was quite the sucessful Friday and Saturday for this family connected through the magnificent broodmare Helsinge and her star dam Scandinavia. 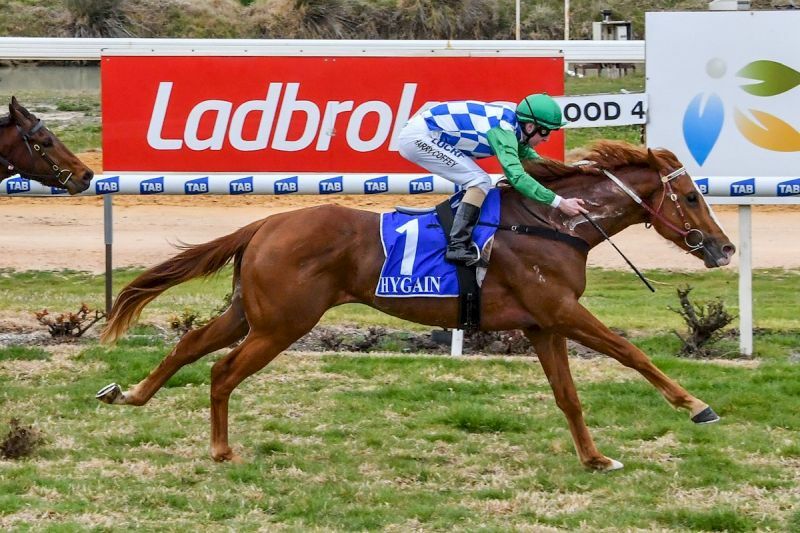 Moshe’s little half brother All Too Hard sired a winner at Geelong on Friday in Hard Faith, which was famously followed by the maiden victory of Oscietra, the first foal of the two young sires’ sister Black Caviar. Further down the racecard, the three sibling’s ‘uncle’ Magnus (out of Scandinavia) sired a winner in Lycka Till (and the Sun Stud sire followed that up with winners around Australia for each of the next three days!). Renowned and respected Irish couple, Sinead and Patrick Hughes have set up their own operation, Sunhill Bloodstock just outside Lancefield in the beautiful Macedon Ranges. 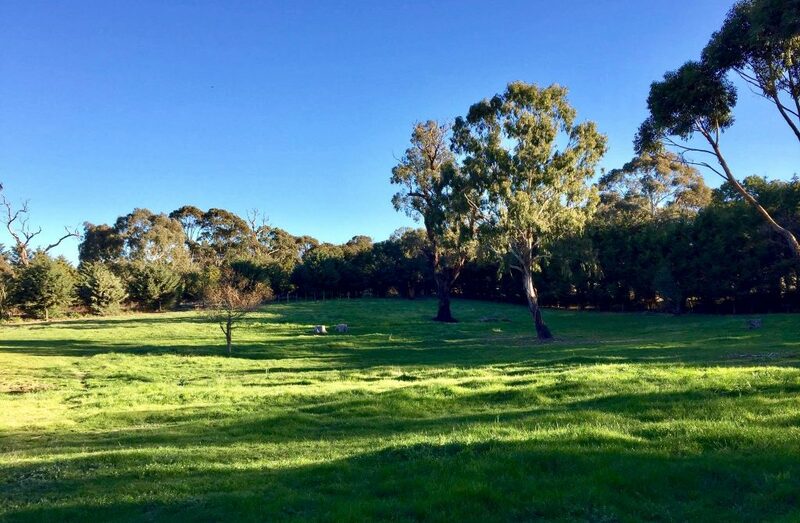 The farm is based in a fertile farming region with rich soil and lush improved pastures in central Victoria and is only 50 minutes from Melbourne or an hour from the Nagambie breeding region. Sinead and Patrick, originally from County Westmeath in Ireland were encouraged to set up their own property, Sunhill Bloodstock, after realising the demand from many good breeders in the industry for an operation of this type. “People were always asking us why we hadn’t set up our own farm, and we have loyal clients that have followed us for years, and now we finally have our own property they have come to support us,” Sinead said. The family run operation will provide clients with one-on-one personalised care for their mares. They aniticpate only having around 15 mares with foals on the property at any one time, so they ensure individual care and attention. “We want to give out clients a sense of fulfillment, it may be sentimental, but we want them to feel at ease in knowing that their mares are being cared for as if they were our own. Every mare is important to us,” Sinead said. During the vital formative months, Sinead and Patrick will ensure all foals are well handled from birth, and will be confident and well mannered to cope easily with the weanling process. With many years experience handling the best bloodstock around the work, Sinead and Patrick have extensive thoroughbred experience in all facets of the industry. “Together, Patrick and I have gained experience on many thoroughbred farms, including managing Yarran and Chatswood Stud. Patrick has international experience handling the stallions at Lane’s End in America for seven years which included working with stallions such as A.P Indy, King Mambo and Smart Strike. He also worked on yearling preparation at the operation. Returing to his native Ireland, Patrick spent ten years working for Shadwell Stud’s Irish base, Derrinstown Stud. Meanwhile Sinead attended Gurteen Agricultural Caollege in County Tipperary, studing Equine Production and Management before travelling to Australia to work for 18 months at Emirates Park in NSW under Robyn Wise. “I came home to renew my visa to return to Australia, but met Patrick who had just returned from Lane’s End, After we married, we ended up staying in Ireland before returning together to Australia as a family ten years later,” Sinead said. On her return, Sinead became yearling manager at Cressfield Stud in the Hunter Valley where she was instrumental in setting a new record for the stud when the Fastnet Rock x River Dove colt made $4 million at the 2013 Inglis Easter Yearling Sale. “It’s a price that I thought was really high, but Patrick prepared the Storm Cat x Hum Along yearling at Lane’s End that made $7,000,000!,” Sinead exclaimed. Together with their family of three beautiful girls, Helena 13, Nicole 9, Michaela 6, they are now well-rooted in Australia and committed to their new life on their Victorian farm. 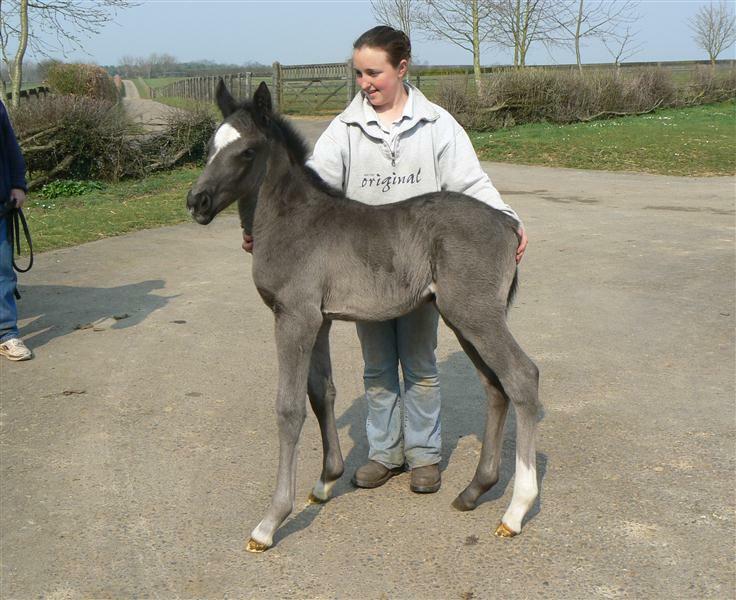 Sunhill Bloodstock is supported by an experienced and reliable local network, with Christoph and Candice Jentsch at Heartford Thoroughbreds in Romsey undertaking their foaling down, and expert senior Veterinary support coming from Dr Ian Douglas. As well as mares and foals, Sunhill Bloodstock will offer yearling and weanling preparation, spelling and agistment. Sinead is also a qualified equine masseuse, having worked extensively in Ireland and more recently with respected equine veterinarian, Susannah Hawkes to massage yearlings when they were sore and tight behind from exercise and being boxed. For more information about Sunhill contact Sinead Hughes on 0475 770 259 or sinead@sunhillbloodstock.com or follow Sunhill Bloodstock on Facebook. 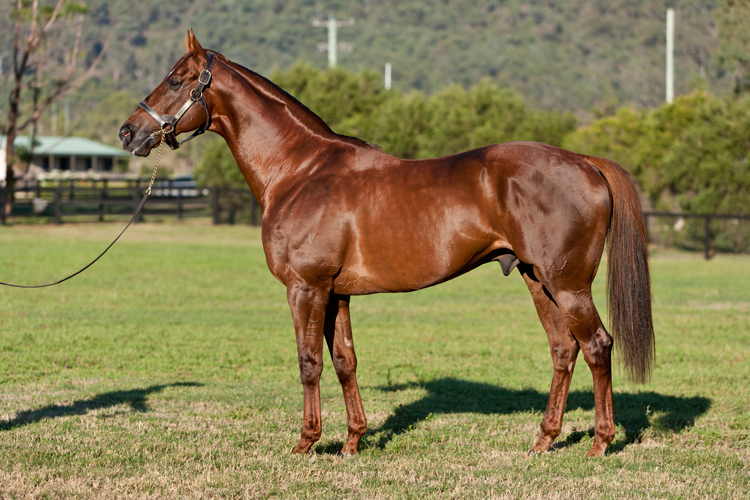 Group winner Shamoline Warrior will be coming home to Australia for the 2017 breeding season to stand at Carin Park, near Hamilton in South West Victoria. The son of Shamardal has been relocated from Monty and Judy Henderson’s Bluegables Farm in Cambridge, where he stood for five successful seasons in New Zealand. Carin Park’s Ron Daniels is excited about the physically impressive stallion coming home to the state of his racing success. 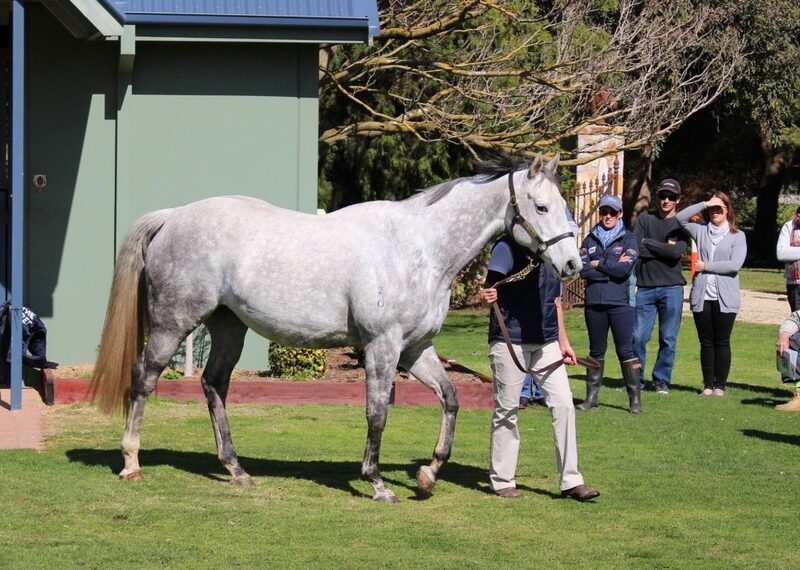 “Having stood stallions at Carin Park in pervious years, including Group 1 Winners Rebel Raider (sibling of Shamoline Warrior) and Curata Storm alongside the very talented gallopers Solo Flyer and Chatline, we are delighted to be standing Shamoline Warrior in his debut Australian season,” Daniels said. Shamoline Warrior proved to be a real athlete on the track, winning on debut as a two-year-old with a last to first effort for his trainer Mark Kavanagh. At three he was successful in the Listed VRC Super Impose Stakes and followed up with a resounding win in the Group 3 MRC Norman Robinson Stakes at Caulfield. A favourite in the Victorian Derby, unfortunately a mild virus caused him to be scratched on the eve of the Group 1 race. A son of the champion Shamardal, Shamoline Warrior has a strong pedigree with current black type performers and producers in his immediate family. Shamoline Warrior began his stud career in New Zealand in 2011 and is now the sire of 29 progeny to race with 15 winners. He has an impressive 51% winners to runners ratio and earnings of almost $500,000, including his first black type winner, the Shaune Ritchie trained Nikita. 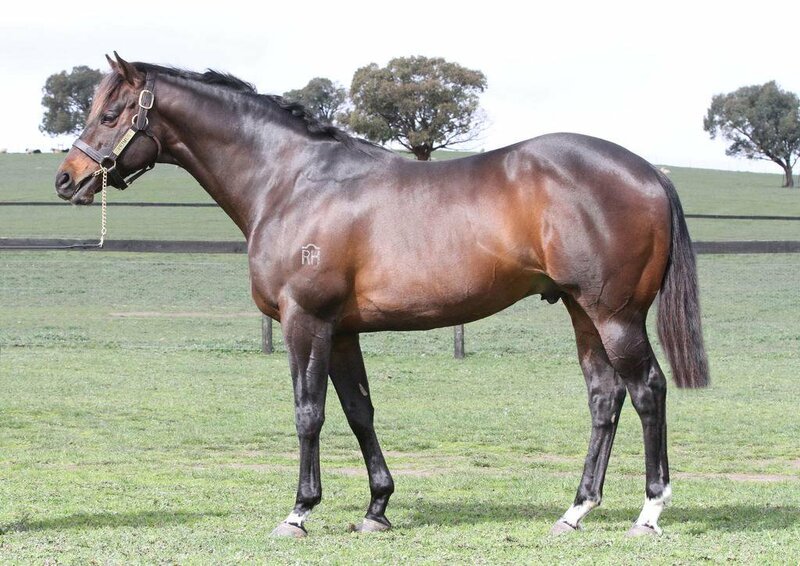 The new Victorian stallion is out of the Group 1 producing and Group 1 performing dam Picholine (Dehere). All six of her live foals have been winners including multiple Group 1 winner Rebel Raider (Reset). Rebel Raider is now a very successful stallion in his own right with Group winners and performers including Waging War, Pretty Punk and Rockstar Rebel. 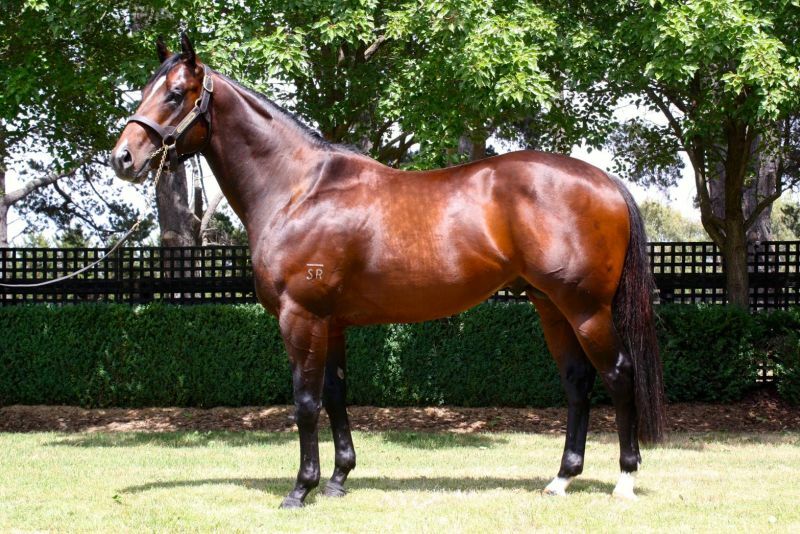 Picholine has also produced Listed winner Cadillac Mountain (Reset), multiple city winner Lucques (High Chaparral) and city winning Sultah (Exceed and Excel) the dam of stakes winning Haybah. Picholine, who was most recently part of the Moodie family’s Yungaburra broodmare band, passed away in 2015. Shamoline Warrior’s black type winner Nikita has also moved to Australia after being purchased by Rosemont Stud and is now in training with Darren Weir. With winners in Australia, New Zealand, Singapore and Macau, Shamoline Warrior has a good number of weanlings, yearling and two-year-olds still to run. Other winners for Shamoline Warrior include Interstellar, Keep On Coming, Stone Warrior, Te Waewae, Bushido, Equilbrium, and the promising Konodon, currently in training in Sydney with Chris Waller, who won two starts back. Shamoline Warrior’s progeny have sold for up to $125,000 at the NZB Ready To Run sales and are currently based in the best stables with trainers Roger James, Mike Moroney, Chris Waller, Darren Weir, Hawkes Racing and Shaune Ritchie. “Shamoline Warrior is physically a large, muscular, and big-boned stallion, in a similar mold to his half brother Rebel Raider, and will be a good out cross to the Danehill influenced broodmares,” Daniels said. Carin Park will stand Shamoline Warrior for the 2017 season for incredible value at only $3,500. Please contact Ron Daniels at Carin Park on 0421 609 668 for more information.